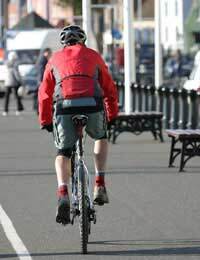 As everybody grows more concerned about global warming, cycling is becoming an increasingly popular way to travel. Not only is cycling non-polluting, it can be a very practical way to get around city traffic. How can you make your local business more appealing to cyclists, and how can you encourage more people to get on their bikes? 2. Nowhere to leave a bike where it isn't at risk of getting damaged or stolen. As a local business owner, you can help to put pressure on your local council to provide cycle paths and make existing roads safer for cyclists. By campaigning for lowered kerbs near your premises you can make them more accessible to both cyclists and wheelchair users. By joining safe ride schemes in your area you can raise your profile and demonstrate the good you are aiming to do for your community. The ideal place for a bike to be stored is under some form of shelter. Even an awning will help to protect it from the elements. However, this isn't practical for a lot of businesses. What you can provide with minimal effort is a rail where bikes can be securely chained up. Ideally this will be visible from inside your premises so that customers can keep an eye on their bikes whilst they're visiting. If you have regular customers who are cyclists, talk to them about their bikes and learn to recognise them. Then you can keep an eye on them too, reducing the risk of theft, which can unfortunately happen even in nice areas. Depending on your type of business, you may be able to help cyclists with other practical problems they routinely encounter. For instance, it's useful for them to know that local shops stock inner tubes so they can find one quickly if they get a bad puncture. This can encourage them to become loyal customers, buying other products too. If you own a garage, hardware store or similar business, be ready to assist with bikes as you might with other machines. It doesn't take much effort to keep a bicycle pump behind the counter and let people use it for free. Cyclists often feel that they are treated as second class citizens compared with car drivers, so by being ready to help you can win their support in return. If you want to go green, don't send small packages around your local area in a van, or hire expensive courier services. Use local bicycle couriers. They're easy to find in most phone books and can provide a highly efficient service at a relatively low price. You can have the reassurance of working with a few individuals so you know you can trust them. Finally, be ready to get on your bike yourself. It sets a great example to your staff and customers if you can cycle to work, and it shows that you're serious about making your business environmentally friendly. It's also good for you and could add years to your life. You can always freshen up and change into more traditional business clothing when you reach your premises. You'll feel more alert as you begin the working day.